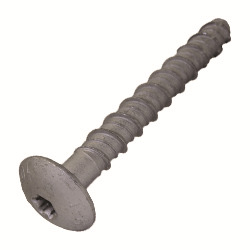 Easy to install, high strength masonry anchor with patented Buttress thread. Suitable for solid concrete and hollow block. Low button head offers a safety benefit compared with standard hex head type..
6 Lobe Torx drive allows high torque installation.. Recess plug also available to seal recess and render the anchor non-removable. NOTE: SCREWBOLTS ARE DIMENSIONED ACCORDING TO ANCHOR SIZE [LIKE A SCREW] NOT ACCORDING TO HOLE DIAMETER AS SLEEVE ANCHORS ARE. BE SURE TO CHECK THE HOLE DIAMETER REQUIRED FOR THE SCREWBOLT YOU SELECT.